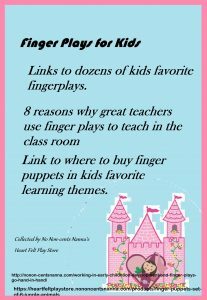 For the love of finger plays this post shares 10 links to dozens of the best fingerplays shared on Pinterest and 8 more reasons why great pre-school teachers use finger plays to teach in the class room. 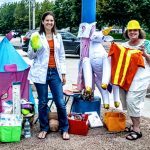 Those of us who teach kids finger plays understand the value of rhythm and rhyme in the learning process. 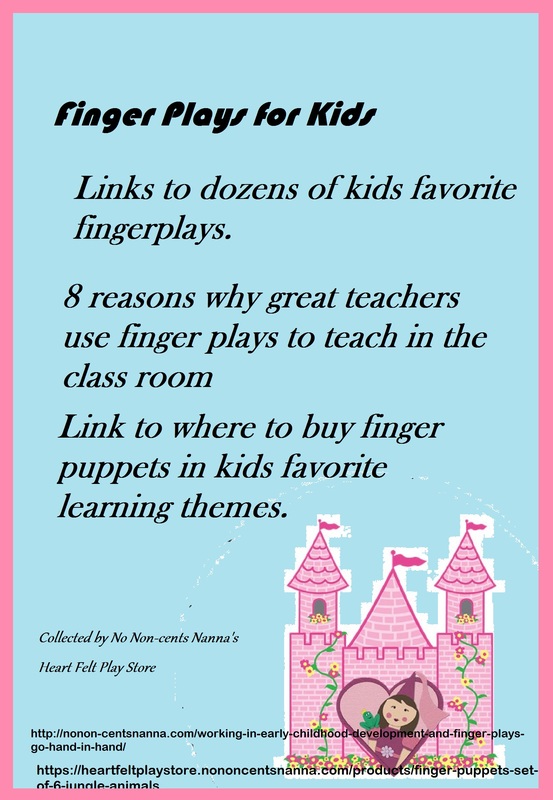 Finger plays can go every where when a child uses his/ her hands and fingers. For increased sensory involvement add cut out felt shapes; coloring book pages; or store bought finger puppets. No Non-cents Nanna’s HEART FELT PLAY STORE creates sets of sensory play items with your child in mind. Kids can memorizes a nursery poem or finger play then when they read that poem in a book they can begin picking out the word on the page. 6. Children feel the sense of a happy community when chanting familiar words with peers. 7.Memorizing rhyms and finger play words are the building blocks of the foundation to early reading skills. Categories: No Non-cents Nanna's BlogTags: 10 links to dozens of the best fingerplays on Pinterest, 5 Little Pumpkins, 8 reason to teach finer plays to kids, children, Colorado Springs event, early reading foundation, felt apples, Felt Ginger Nap Babbies, felt owl finger puppet, felt turtle, FREE gfit from No NOn-cents Nanna to Colorado Springs teachers, hand crafted felt shapes, kitten and mittens, No Non-cents Nanna, pre-school learning tools, reasons to do Finger Plays, Watch for Heart Felt Grand Opening discount codes.